The Soyuz payload fairing is adorned with logos and national flags related to the six satellites carried on tomorrow’s Arianespace launch from French Guiana. ....moving preparations into their final phase for a nighttime liftoff tomorrow with six satellite passengers. This authorization followed today’s launch readiness review, which validated the mission-ready status of Soyuz, its satellite payloads, the Spaceport’s ELS launch site, and the tracking network that is to follow the mission on its Sun-synchronous orbit deployment trajectory. The review milestone is part of preparations for all Arianespace flights, and will be followed by a meeting at 4 hours, 20 minutes prior to liftoff that authorizes the Soyuz’ fueling – a step included in the final mission approval process for the Russian-built launcher. Soyuz’ December 16 liftoff is scheduled precisely at 11:03:08 p.m. local time in French Guiana, initiating a 3-hour, 26-minute mission that will release the largest passenger – France’s Pléiades 1 imaging spacecraft – first, followed by the simultaneous deployment of four French ELISA micro-satellites, and concluding with the separation of Chile’s SSOT Earth observation platform. The flight’s payload lift performance is calculated at 2,191 kg., which includes approximately 1,400 kg. for the Pléiades 1, ELISA and SSOT satellites, along with the weight of a purpose-built payload dispenser and integration hardware. 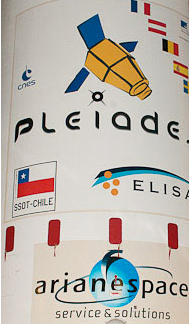 Pléiades 1 has a liftoff mass of 970 kg., and will provide military and civilian users with optical satellite imagery that offers 50-cm. resolution imaging products at a coverage swath width of 20 km. The four ELISA demonstrator satellites weigh 120 kg. each and will be used for electronic intelligence (ELINT) mapping of radars and other transmitters worldwide and the determination of their technical characteristics. SSOT is a dual-role military/civilian spacecraft weighing 117 kg. at launch, and will perform missions that include mapping, agricultural monitoring, and the management of natural resources, disasters and risks. Tomorrow’s launch comes less than two months after Arianespace’s historic introductory mission of Soyuz at the Spaceport, which occurred on October 21.